Judicial Crisis Network (JCN), a conservative political advocacy group, has already spent almost $1.1 million on more than 2,121 television ad spots since February to support the confirmation of U.S. Supreme Court nominee Neil Gorsuch, according to numbers compiled by Bloomberg BNA from Kantar/CMAG data. JCN’s spending easily dwarfs the $17,000 spent by People for the American Way (PFAW)—the progressive group started by television and film producer Norman Lear—against the nominee. Typically these ads from JCN and PFAW urge the public to tell their senators to vote for or against Gorsuch. No other groups are listed as having released advertising related to Gorsuch’s nomination, although the National Rifle Association’s Institute for Legislative Action announced a $1 million ad campaign for Gorsuch on March 28. JCN spent about $1.3 million in both 2015 and 2016, but it was split between ads against then-President Barack Obama’s nominee Merrick Garland and a potential nominee, U.S. Circuit Judge Jane Kelly. Garland’s nomination was never brought up for a vote in the Senate. The group previously committed to spending $10 million to support Trump’s pick and $7 million to oppose Garland. During Gorsuch’s confirmation hearings, Sen. Sheldon Whitehouse (D-R.I.) questioned the purpose of that spending. “I’m trying to figure out what they see in you that makes that $17 million worth their spending,” Whitehouse told Gorsuch in a hearing. Lobbying and campaign finance rules don’t cover advertising related to Supreme Court justice nominations, so there is little detail about what groups or individuals are funding JCN’s work. JCN’s spending highlights the growth in Supreme Court nominations as expensive, unregulated political campaigns that have driven the partisanship of judicial appointments. Montana and North Dakota received a blitzkrieg of ads by JCN supporting the Gorsuch nomination. In total, there were more than a thousand ad placements across markets including Billings, Butte and Missoula in Montana and North Dakota’s Bismarck and Fargo. Indiana, though, appears to be the largest target of JCN’s money, with more than $372,000 spent on 612 ad spots so far. JCN appears to be putting pressure on vulnerable senators. Four states targeted are Republican-leaning and have Democratic senators up for re-election in 2018: Joe Donnelly (Ind. ), Claire McCaskill (Mo. ), Jon Tester (Mont.) and Heidi Heitkamp (N.D.). During the period when Garland was nominated, JCN ran ads aimed at potential swing votes, like Joe Manchin (D-W.Va.) and Heitkamp, to vote against Garland, as well as ads to support Senate Majority Leader Mitch McConnell’s (R-Ky.) lead in preventing a vote on Garland. Jennifer Baker, director of public affairs with the National Rifle Association’s Institute for Legislative Action, told Bloomberg BNA the group is targeting the same senators as JCN is. While its $1 million ad campaign hasn’t run yet, she said the group has started campaigning through direct mail, social media and by phone. No progressive groups besides PFAW are listed as having run ads, although two progressive groups, MoveOn.org and Ultraviolet—a women’s rights advocacy group started by formerMoveOn.org employees—spent over $20,000 on ads supporting Garland. Carrie Severino, chief counsel and policy director with JCN, said the organization’s spending related to Gorsuch was only a small part of its efforts to support the nominee. “It’s a full-court press that involves a wide range of strategies,” including door-knocking, phone campaigns, and house parties arranged by JCN and other affiliated groups to inform voters about the merits of the nominee, Severino told Bloomberg BNA by phone. In a 2006 interview with the University of Virginia’s UVA Lawyer, Leonard Leo, executive vice president of the Federalist Society, indicated that campaigns involving Supreme Court Justices John Roberts and Samuel Alito were expensive endeavors. Leo has been credited with recommending Gorsuch to President Donald Trump. According to the interview, the total bill to get each nominee—Roberts and Alito—confirmed was about $15 million, and both campaigns involved recruitment of supportive organizations, public opinion polling, background research, media training, public relations and support for the presidential campaign of George W. Bush. According to its website, the Federalist Society believes in the benefits of limited government but it does not support specific policies or candidates and does not engage in political advocacy. Severino painted JCN’s tactics as a necessity resulting from partisan attacks and regular filibustering of previous nominees for courts of all levels, beginning with Ronald Reagan’s 1987 Supreme Court pick, Robert H. Bork and continuing with George W. Bush’s lower-court choices and the filibuster against Supreme Court Justice Samuel Alito. Bork was rejected in a 52-48 vote following a campaign by PFAW that included TV ads against the nominee narrated by Gregory Peck. During the nomination process, Bork lambasted the treatment of judicial nominees as political candidates and vowed not to campaign for his confirmation. Various Democrats vowed to filibuster a Republican nominee after Garland was never allowed a vote. Josh Earnest, White House spokesman under Obama, described the denial of a Garland vote as permanently scarring the Senate. Drew Courtney, communications director with PFAW, highlighted the lack of a Garland vote and the Republican filibustering of uncontroversial Obama nominees to the lower courts “simply because they didn’t like the president who nominated them” as undermining any complaints about collegiality. Courtney also described PFAW’s involvement as a necessity because of the importance of the seat on the bench and the lack of public information about Gorsuch’s views. “People are painting Gorsuch as having never thought about issues, just calling balls and strikes, but that’s preposterous. He’s making very big decisions that will massively shift the direction of the country,” Courtney said by phone. 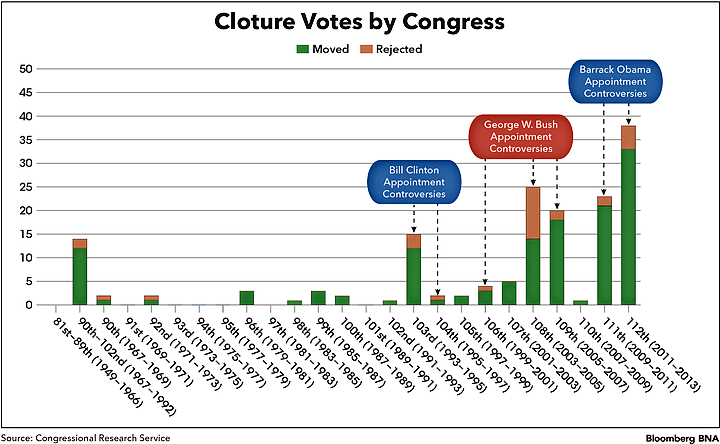 According to numbers from the Congressional Research Service (CRS), votes on judicial nominations have increasingly led to cloture—forcing a vote to end debate—because of filibustering in recent years. Cloture votes on nominees used to be rare but by the 112th Congress (2011-2012) there were 26 such votes on judicial nominees alone. A separate 2013 CRS report listed 86 cloture votes on nominations of any kind since 2009, which is 49 percent of all cloture votes. Although cloture votes are often used to end a filibuster, not all filibusters lead to cloture and not all cloture votes are a result of filibusters. Although little is known about JCN’s donors or its total ad spending related to Supreme Court nominees—because disclosure of such spending is not required—Internal Revenue Service filings shed a little light on the matter. The filings indicate JCN receives the bulk of its donations from a single entity, a nonprofit called The Wellspring Committee that also funds the Federalist Society but whose donors are unknown. PFAW is listed as the recipient from several donor-advised funds such as Columbus Foundation, Akron Community Foundation, Network for Good, the Jewish Communal Fund and various labor groups like the Service Employees International Union (SEIU) and American Federation of State, County and Municipal Employees (AFSCME). In the IRS filings, both JCN and PFAW list a wide variety of marketing and campaign tactics, including get-out-the-vote campaigns, leadership development and internet outreach. JCN lists $177,000 spent on the nomination of Justice Sonia Sotomayor and $347,000 on Justice Eleanor Kagan out of a yearly total budget that varied from $50,000 to $1.5 million. PFAW spent about $4 million in total on Supreme Court nominations from 2004 to 2006, around the time of the Roberts and Alito nominations. Although JCN spent more, IRS filings show that PFAW’s budget is much bigger. 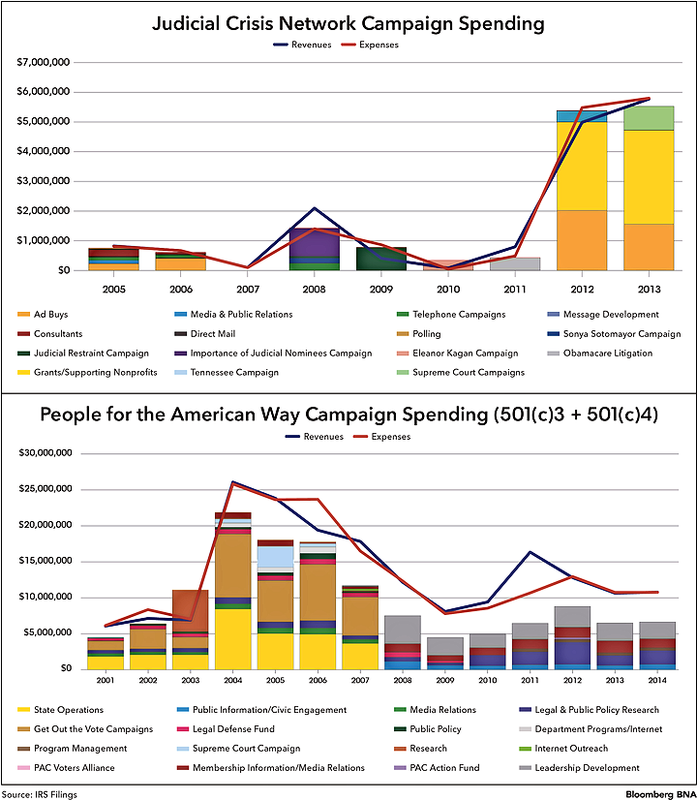 The combined expenditures of People for the American Way, a 501(c)4 exempt organization, and People for the American Way Foundation, a 501(c)3, varied from a low of about $5 million in 2009 to more than $20 million in 2004.